Juliana, performed by Tamsin Kelsey, had incredible presence on stage. She plays the successful neurologist that presents herself with confidence even though her life is seemingly falling apart. As audience members, what we think is ‘real’ is really not. Is Juliana actually going through a divorce? Does Juliana truly see a girl in a yellow bikini at a lecture she is delivering? I love stories that have you thinking about the what-ifs. However, even with the questioning and pondering, I found that the beginning of the play got off to a slower start. I needed a little more meat with my potatoes. The story did begin to unfold in the second half of the production and I was all ears! 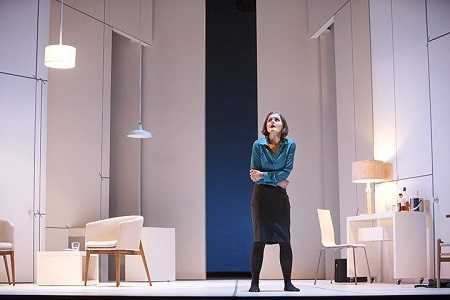 In the second half of the show, the audience is taken to Juliana’s old home (the other place) where her and her husband once lived but had to leave to escape from the haunting memories. What are those haunting memories and are they really real? That is something you will have to discover when you see the show. What I can say is that one of my favourite moments was in the other place and involved Juliana and The Woman, played by Haley McGee. In this heartfelt scene, The Woman and Juliana showed a range of emotions that struck a cord with me. Some of these key emotional moments were so strong in The Other Place that I would have loved if there were more moments like that in the play. At times it fell flat but the strong actors kept me engaged. Overall, this Canadian Stage production touched on some serious topics but also injected in some humor, suspense and creative dialogue along the way.